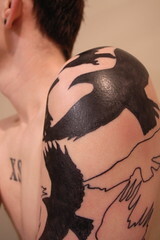 Crow inspired body art. Transformation. Intellect. Intrigue. Dark beauty. Crows invoke emotion. Inspiration. Strength. 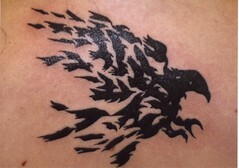 I found some excellent crow tattoos and thought I would share them with you. These are not the ONLY crow tattoos I found just some of the ones I thought worth sharing. Maybe I will continue to add posts like these every now and again. A murder of crows forming one. Very stylistic! I love it. The birds are great. Albeit, they seem as if they are flying away from his armpit! They are beautiful. Escaping something, fleeing. I would like to see the original drawings. These are beautiful crows. Simple, elegant. They are tasteful little tattoos. Her top is original as well. We crow lovers are unique creatures, aren’t we? Do you think they symbolize more? She calls this photograph “lifestream.” Crows have been around as long as life, haven’t they? The birds represent 1’s. The spaces represent 0’s. Excellent tattoo. I love the dark black. It doesn’t lack in detail—it represents the crow. I can’t tell you how many photos I’ve taken of crows that have come up as black outlines, shadows. They are elusive and beautiful–majestic. Hrm. Immediately the violence is palpable but is it really depicting violence or intellect and inspiration? From within the girl comes a murder of crows. She is the source of the murder, a murder. A murder of crows. Beautiful. The lines, the mess. These are crows. They fly about in a hurry often leading to the stereotypical fear and loathing of themselves. They are beautiful but menacing at times. This arm is a work of art, isn’t it? It is a piece of living art, this arm. Sleeved-worthy. Nice. Part crow part skeleton. This is an interesting tattoo. I really like it. 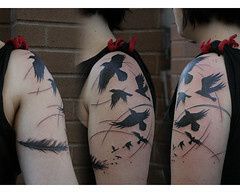 I am infinitely curious about the history of the corvid family and this tattoo speaks to that curiosity. I would like to see the original art for this one as well! Originally uploaded by TC . And for a gorgeous finale. This girl has two crows/ravens and her hair contrasts them well, doesn’t it? Many crows appear almost blue black. Jaci Sue, Steve Losh, Dani82, CheyKu, Kapten Hanna, Sylvie and here, Monkinnabeanpod, DrowningWoman, dconley, lostlilly80, LiquidKnight, The Feng Shui Guy, and riggsmal.